Recently, we shared the story of Khalida, the woman who lost her leg while shielding her children from an airstrike. In Iraq, a disability like that can often mean the end of your ability to work—but Khalida is defying this notion. 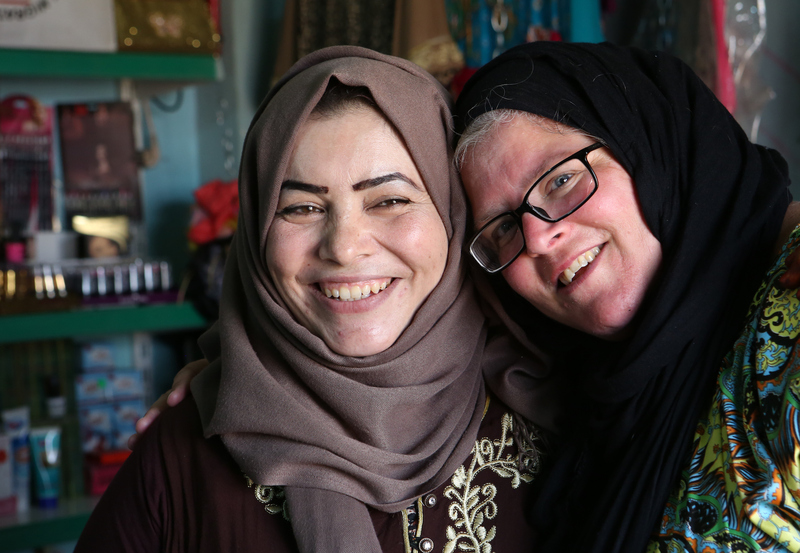 With your help, she opened a clothing shop in an old hotel where her family lives with others who were also displaced by ISIS. It’s important that we don’t just talk about those displaced by war. It’s important that we listen to their stories and hear their voices. I am Khalida Atta from Al-Musahaq. I am disabled, and I am the mother of four children. We live in this room. It’s the only place we have. I was outside when the plane came. It kept coming down and going up. I saw the pilot wearing headphones. I saw his hair and face. When the plane came low, he could see that I was a woman holding a child, not an ISIS fighter. When he fired his first bomb, I waved a white shirt to stop him from firing more bombs at us. There was a very loud noise, then we could not hear anything anymore. The plane dropped the bomb on civilians. Once I opened my eyes, I realized I had lost a leg. My children and husband were injured, too. I replied that I am not important. The important thing is that they are OK.
My cousins died in the attack. We also lost our homes. [After the attack], I worried we might not find another house. I cannot move, and I really want to walk. I would like to enjoy my life. I want to go shopping, to hang out. But I can not do anything since I lost my leg. My husband is sick. He cannot hear properly, and he’s had some psychological problems since the attack. All of us in this building are refugees. [My family] lives in one room, and we use it for everything. It’s the same room I use as a shop to sell my products. My mom is in the room next to us. My sister is in a room on another floor. Living here is very difficult, because every time I go out, my husband needs to carry me to the ground floor. When I come back, he has to carry me back upstairs. Despite all this, I thank God that I am still alive and able to take care of my children. For a long time, I’d wanted to open a clothing shop for women. I’ve always had ambition for that. Before this shop, I would never go out. Now I go outside and buy what I need for the shop. I choose the products I sell—women’s clothes, children’s clothes, perfumes, makeup, underwear, and whatever else the customer needs. People from the whole building come to buy from my shop. My sisters, cousins—they all come to buy from my shop. Everyone who knows me and all my relatives come to me. It’s the only income we have for me and my kids. My dream is to make the shop larger. And to have a proper shop somewhere, not in my room like now. When we return home, I will make another shop. A bigger one. I will never let go of my dream. I will call it “Mustafa’s Shop.” I will name it after [my youngest son] Mustafa, because he was a baby when I lost my leg. My hope for the future is to raise my kids. I will send my kids to school. I will teach them and see them grow up and have a good future. Inshallah [God willing]. All of me is for them.